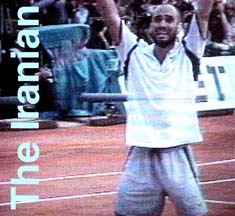 Andre Agassi is not the first tennis player with an Iranian background to have won the French Open. That honor goes to half-Iranian Fred McNair who in 1976 won the doubles title. But Agassi's miraculous 1-6, 2-6, 6-4, 6-3, 6-4 comeback victory over Andre Medvedev Sunday is far more significant. Agassi, who won Wimbledon in 1992, the U.S. Open in 1994 and the Australian in 1995, joins Fred Perry, Don Budge, Roy Emerson and Rod Laver as the only men to have won all Grand Slam titles. Pete Sampras hasn't done it, neither have such legends as Bjorn Borg, Ivan Lendl, Jimmy Connors, John McEnroe, Guillermo Vilas, Arthur Ashe, Mats Wilander, John Newcombe or Ken Rosewall. Now that's special.